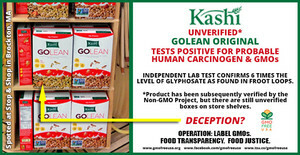 UNIONVILLE, CT, Aug. 04 /CSRwire/ - GMO Free USA today published the results of independent lab tests documenting that a box of Kellogg’s Kashi GoLean Original cereal which had not been verified by the Non-GMO Project contained glyphosate residue and an even higher level of AMPA (aminomethylphosphonic acid), a metabolite of glyphosate. Glyphosate is the main chemical ingredient in Roundup herbicide. Most of the genetically engineered corn and soy being grown in the U.S. have been engineered to tolerate spraying with glyphosate based herbicides. “Monsanto’s Roundup, the trade name for the herbicide glyphosate, causes birth defects and cancer and probably triggers a host of chronic diseases. Allowing glyphosate to be present in our food should be a criminal offense. It is basically mass poisoning of the population including our children,” said Jeff Ritterman, M.D. In March, The International Agency for Research on Cancer (IARC), the specialized cancer agency of the World Health Organization (WHO), concluded that there is sufficient evidence of glyphosate’s carcinogenicity in experimental animals and classified glyphosate as probably carcinogenic to humans. The level of glyphosate detected in the Kashi cereal was nearly six times higher than the level documented in a recent test on Kellogg’s Froot Loops. This is the first time that AMPA has been detected by testing commissioned by the public interest nonprofit. Tests also documented that the Kashi cereal contained significant levels of genetically engineered soy and insecticide-producing genetically engineered corn that is regulated by the EPA. There is substantial and growing peer-reviewed scientific evidence that both GMOs and glyphosate are damaging to health. While Kashi GoLean Original has subsequently gone through Non-GMO Project Verification, there are still unverified boxes on grocery store shelves and it is likely that there are other Kashi brand products which contain similar ingredients. “During our July tour with Neil Young to educate concertgoers about GMOs, we were shocked to see unverified and Non-GMO Project verified boxes of Kashi GoLean Original mixed together on the same display at a Brockton, Massachusetts Stop & Shop grocery store. This is a shameless attempt to unload Kashi’s GMOs onto unsuspecting customers. There are likely thousands of boxes on store shelves across the nation and we’re calling on the public to demand that store managers remove those boxes immediately,” said Luan Van Le, GMO Free USA’s Communications Director. While the company is moving away from GMO ingredients in their Kashi brand, it has made no attempt to do the same for the products it markets to growing, vulnerable children. In the two years ended 2014, Kellogg’s spent $3.6 million to lobby against mandatory GMO labeling. The company also contributed approximately $2 million to the campaigns that narrowly defeated citizens’ ballot initiatives for mandatory GMO food labeling in California, Washington, Oregon and Colorado.